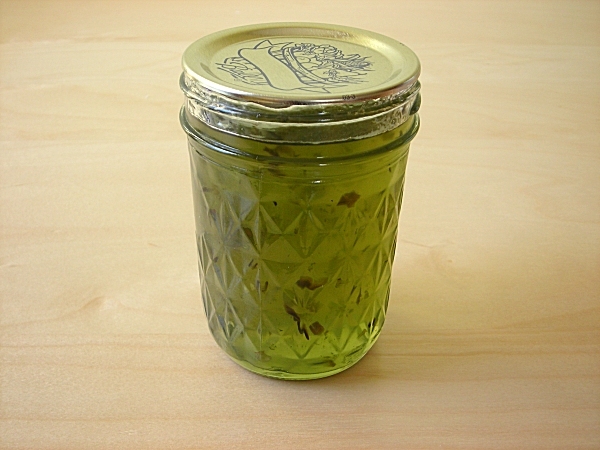 This is "apple pepper jelly"; it's the first time I've made it. No I don't really know what I'm going to do with it yet, but I didn't want to make all regular jelly thus this creation was born. Ok, I lie a little bit; I did basically follow an online recipe. The floaties in there are jalapeno peppers. I'm thinking this stuff will be good as a topper for cream cheese and crackers. I hope somebody likes it because I made 7 jars of it. 10/10/2008 - I've served this up several times now on variety crackers smeared with a bit of cream cheese and it's been a big hit. Some people are turned away by it being called jelly so I've decided to call it a spread instead. It's a rather odd combination of sweet and hot. The heat is actually pretty mild / mild plus IMO and the sugar could have been reduced. Anyway, since I've seen a lot of folks hitting my page searching for this recipe I'm adding my recipe and notes to this post. Put the water, butter and food coloring in a sauce pan and gradually add the pectin while bringing the mixture to a rapid boil that won't stir away. Add the jalapeno mixture and bring it to a hard, rapid boil stirring constantly for 1 minute. (the 1 minute countdown begins after the mixture has reached the rapid boil point. I'd already put the jellies in the basement before taking the picture of it. Sure I've made regular old apple jelly before, but this year I decided to make apple jelly with a touch of cinnamon and a sprinkle of other spices like nutmeg, ginger and all spice. The apple juice that was used to make both of these flavors was from last fall when Kelly and I made applesauce. 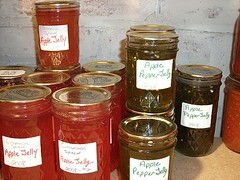 The best apple jelly is actually made from the apple peels and not the apples themselves. Seems strange I know, but I've made it both ways and the peel method is better. This time I added a couple of cinnamon sticks to the pot as it simmered on the stove to give the apple juice a pleasant cinnamony flavor. Apple jelly is probably the easiest jelly to make and can because apples already have a natural pectin which imo really helps with setting up the jelly when used with a regular packet of pectin of course. I have read where you can actually make your own pectin from apples, but my name is Marni... not Martha!